OMAHA, Neb. (KMTV) — "He's lived a life as hero," Live on Nebraska Family Coordinator Paula Wallace said. Ralston firefighter Brian Saathoff lived his life for others. "He was the type of person that brings everybody together," Ralston Fire Chief Kevin Eisheid said. If a task [to be] needed done, it would get done, with Brian." Friday morning, Saathoff received the highest honor of his lifetime, he took his final 'Hero Walk' among family, friends and coworkers. "Waiting rooms are filled with people, [and] that hall was lined with people that cared about him," Wallace said. And every single person that's going to receive an organ from him has a lobby like that." Saathoff was declared brain dead earlier this week, but today he's giving life and hope to four others who are awaiting transplants. "You can't count the number of people that are impacted by every single organ," Wallace said. Even if it's just one." 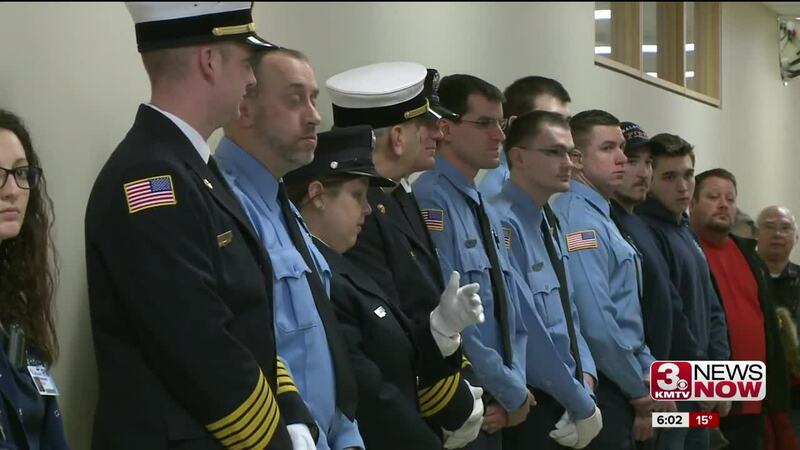 Members of the Ralston, Papillion, Bellevue and Gretna fire departments filled the hallways as Saathoff was taken intro transplant recovery surgery. Saathoff leaves behind his wife and four children, along with multiple grandchildren. He was with the Ralston Fire Department for more than 10 years. "He brought that family category to the department, just with his attitude and overall presence," Eisheid said. "It was so moving for them to know that he was loved, as much as they love him," Wallace said. Live On Nebraska tells us Saathoff's body will also provide tissue donations that will potentially help up to 100 people. "He's been a hero, that has been his life," Wallace said. And not only that, he comes from a line of firefighters and so for him that's everything, that's why he got up in the morning everyday." Described by many as humble, generous and always willing to help others, and having loved his family dearly Saathoff's spirit is sure to live on and impact even more lives for years to come. Visit https://liveonnebraska.org/ to learn more about Live On Nebraska, and how to become and organ donor.